All prices are effective from an order value of 100.00 €. Delivery is excluded to islands and special zones if not otherwise agreed. What should be the maximums size of the parcel? The maximum size is 120cm length, 60cm width and 60cm height. 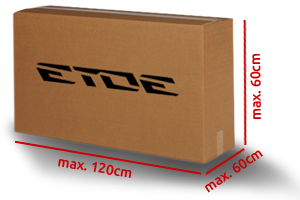 Does my frame set fit into a parcel? Yes, 99% of all frame sets up to frame size 60 fit into a parcel with the measurements mentioned above. I have a bigger parcel. What should I do? The parcel can be deminished with a knife to the required size. What happens if I need a bigger parcel? A fixed rate of 20.00 € for bulky goods will be charged. YOU DO NOT HAVE A SUITABLE PARCEL? WE CAN SEND ONE TO YOU! You would like to send your frame to us but you do not have a parcel? We are glad to help. We can send a package including packaging material and a return note to your home address at a fixed rate of 15.00 €. You box your frame set, put the return note on the parcel and bring it to a nearby post office.